This is an interesting item of park memorabelia that we feel is probably among the very first publications sold for ten cents to visitors to the park at a time very close to the activities of the Civilian Conservation Corps. 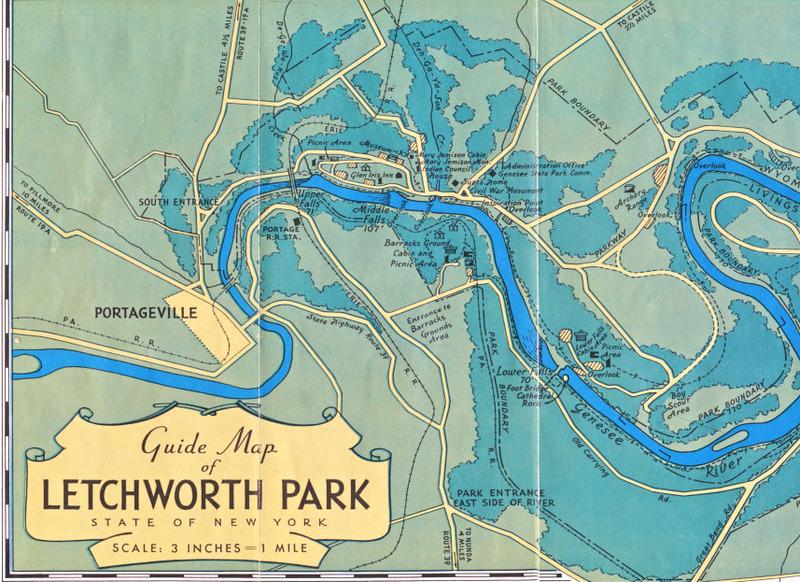 The map of that time period shows us what existed in the way of park features but does not show the CCC components and that is probably because they were being phased out. On the west side of the park things are shown much as they are today with picnic shelters shown with parking areas shown with cross hatching. The Administration office Genesee State Park Commission is identified on Glen Iris road and originally was the McCarthy house. The park road is called a Parkway - a name that never caught on in Letchworth. the river (bottom of the map) is where we find the most differences with today. The road pattern as it existed then and the park boundary are very different. 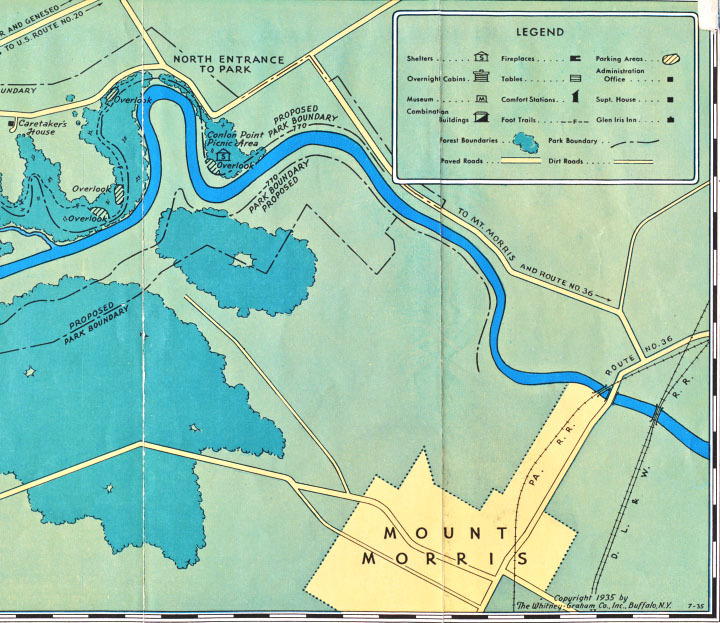 At that time the railroad was park boundary from the town road that entered the Barracks Grounds (now Parade Grounds) to its intersection with River Road. In some area both east and west the park boundary is shown as a solid dark line broken up with dashes and also shown as a wavy line with the number 770 interspersed along the line and is a surprising indication that the elevation above sea level that would eventually be the actual boundary between the land owned by the U. S. Army Corps of Engineers and the park. Wolf Creek had not been part of the original 1000 estate. That area, and nearby Tea Table Rock had become important picnic areas by the time this map was made. Also by this time several other changes are apparent. The most significant, perhaps was the disappearance of the once bustling community of St. Helena, which would have been located to the lower rightof the St. Helena Picnic Area, where the bridge appears in the map. Note the "Great Bend Development" below the river. 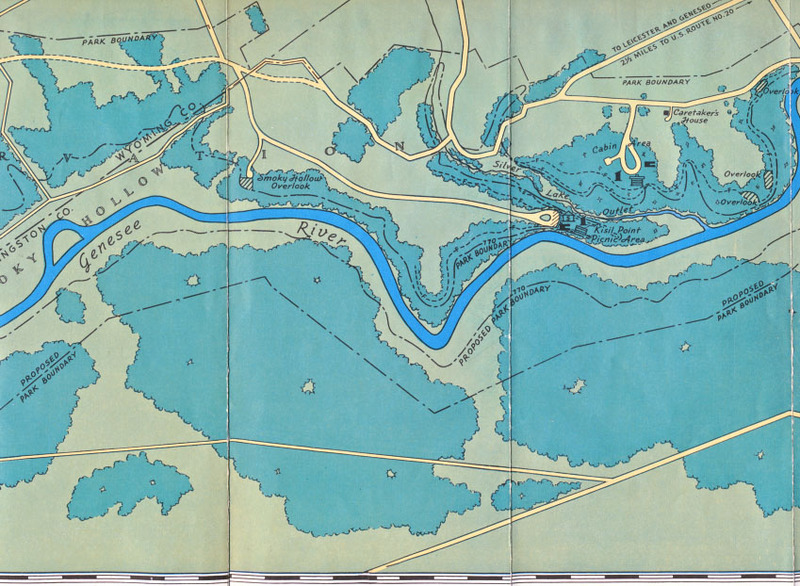 That was the site of the Civilian Conservation Camp that built the cabins at what is now cabin area E.
At the bottom of this map section is present day River Road. The park boundary is now closer to river road in several places. 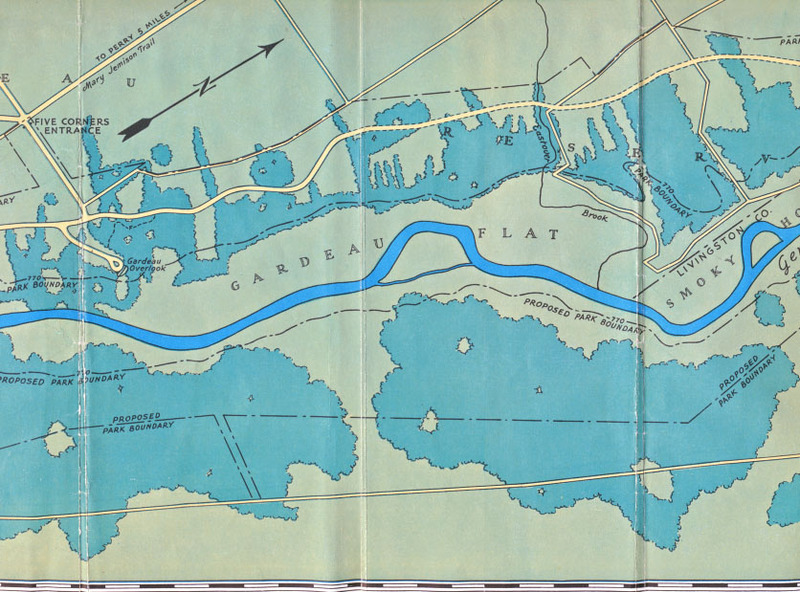 Gardeau Flats are shown as is Smoky Hollow ( note the lack of "e"). Park employees and local people use these terms which are not on current park brochures. Five corners is no longer an entrance but is a landmark still known by that name. Again the access road is controlled and the road to the right is part of park boundary and is discontinued. CCC program had a quarry in that area and also had begun a picnic area along the road to Gardeau Overlook that was never finished. Wooded areas are shown as at the time.Today the whole area is wooded either by CCC planted conifers or natural succession of native trees. The road north from Five Corners is called Mary Jemison Trail but is known today as Middle Reservation road in the Wyoming County highway system. The long thin piece marked with park boundary out to River Road is much shorter now and is Trail 22 on park maps. Trails are abundant on that Livingston County side of the park now that did not exist in 1935. 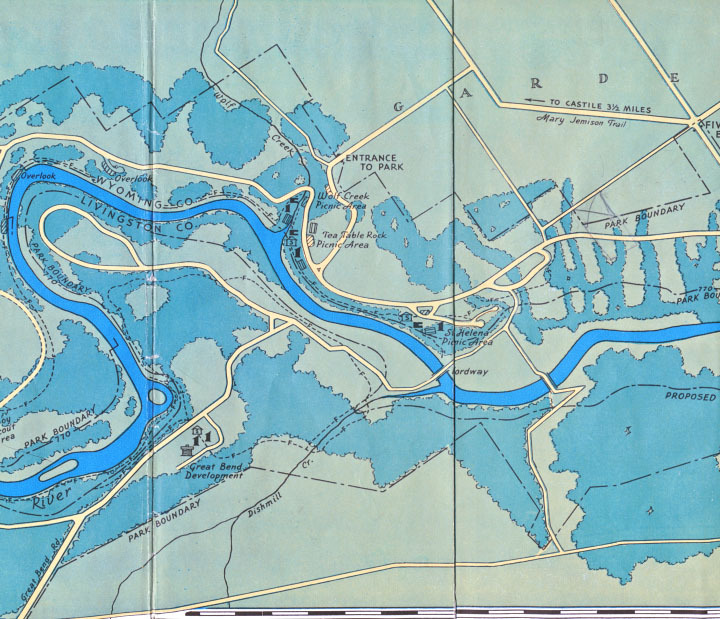 On the section of the map found below, the "proposed park boundary" near the river again refers to the elevation above sea level that marks the area below which the Federal Government owns . It is marked 770 which was eventually changed to 760 to give the park more land but also to keep flood waters farther downstream from the base of Lower Falls. Road changes are also the rule in this section. The one coming in from the top of the map along Silver Lake Outlet is eliminated. The one coming in from the upper right that gives directions to Leicester and Geneseo is gated for use at the convenience of the park. The double dashed line gives the best approximation of present park road. The roads between that line and the county line are abandoned and are now part of the trail system. The road that begins near the county line and goes to Kisil Point picnic area is now the entrance road to the Highbanks Camping Area. Access to Kisil Point is by foot trail only and the trail goes by the 100 loop of the camping area that was "A" loop up to about 1990 when the number system was adopted. The road going in the opposite direction from the camping area road is the present Perry Entrance road. The road shown going left from Rt 36 still exists as far as the road shown as "North Entrance of Park" but it is outside the park line and is a Town road that runs roughly parallel with the present park entrance road. The North Entrance road is gated close to the Town road and is in use at the convenience of the park. Conlon Point picnic area is part of the major development of the Highbanks Recreation area with its modern picnic shelters, huge parking areas, police headquarters and the G. W. Harvey swimming pool. To the left the "Caretakers House" is intact as residence and rental office for C cabins. The cabins are a CCC product as is the Caretaker House which have been modernized for winter use. Below the river the park area has been greatly enlarged because of the Mount Morris Dam and the developments related to it including an entrance road, maintenance building for Corps of Engineers staff and more recently a visiitors center to serve the public. This is known as the "Federal Reservation" and is in control of the Corps and is set out from the land the park leases from the Corps of Engineers.